We serve as a resource to those on the front lines of public health in Indiana’s 93 counties, with the shared goal of improving the consistency and quality of public health services in all our communities. One way we do this is to assist LHDs going through the process of becoming accredited. In 2016, the Rush County Health Department became the first health department in Indiana to be awarded national accreditation by the Public Health Accreditation Board (PHAB). Our faculty worked closely with Rush County on their community assessment in 2010 and in 2015 to help make this a reality. In 2015 and 2016, the Center for Public Health Practice and our faculty and staff also worked with Montgomery County Health Department as they completed their pre-accreditation work that was submitted to PHAB in December of 2016. The Center for Public Health Practice has provided technical assistance related to the accreditation process to more than 10 Indiana counties. Several counties have made significant progress in the application process. Indiana currently ranks 39th in the nation for smoking rates (America’s Health Rankings, 2016 Annual Report). 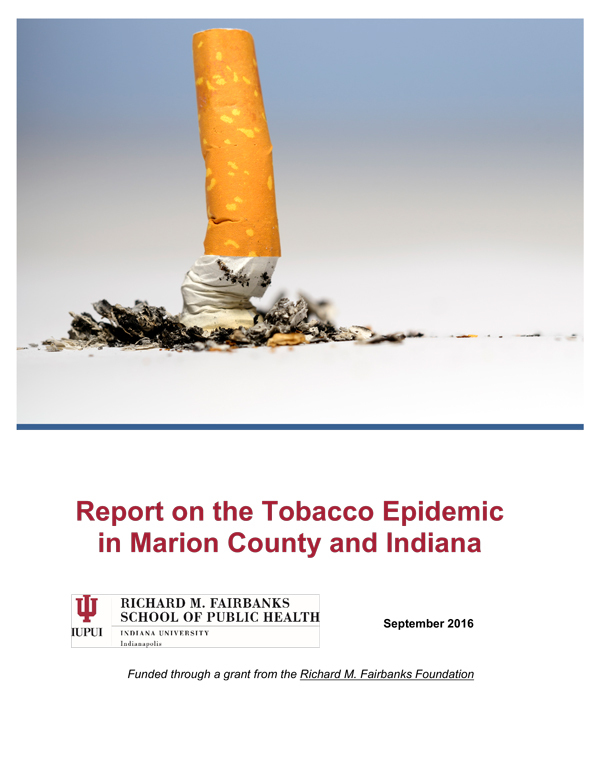 To explore this significant public health issue, the Fairbanks School of Public Health faculty and staff authored the Report on the Tobacco Epidemic in Marion County and Indiana (September 2016) in partnership with the Fairbanks Foundation. The report was a key factor in the Alliance for a Healthier Indiana’s decision to select tobacco usage as its first priority. To obtain an accessible version of this report, please email fsphinfo@iupui.edu. Recently, Indiana has been in the news due to our rising rates of opioid use and overdose. 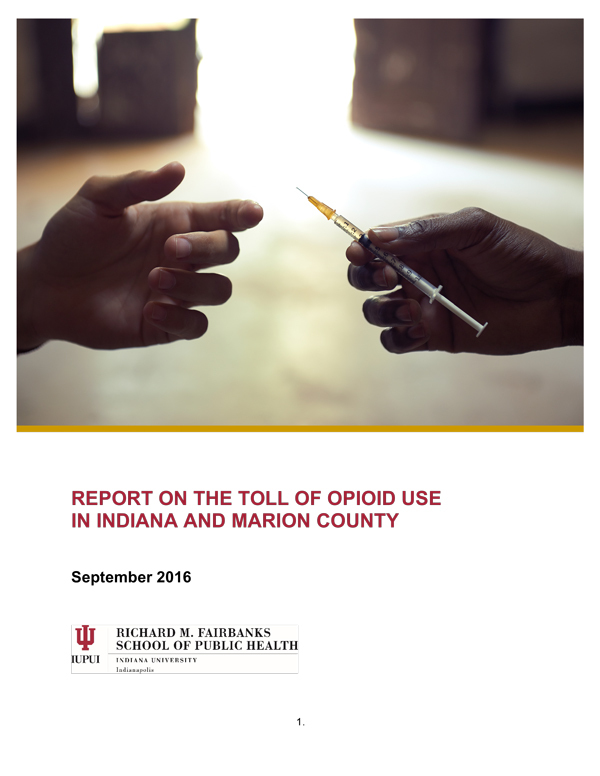 To explore this issue, faculty and staff at the Fairbanks School of Public Health authored the Report on the Opioid Epidemic in Indiana and Marion County (September 2016) in partnership with the Fairbanks Foundation. The Fairbanks School of Public Health is collaborating with the Indiana State Health Department and Indiana Division of Mental Health and Addiction to evaluate federally funded opioid prevention and treatment programs in order to measure impact and improve effectiveness. To obtain an accessible version of this report, please email fsphinfo@iupui.edu. We are working with more than 15 counties to develop syringe exchanges and primary prevention activities. Founding Dean Paul Halverson and Associate Dean Joan Duwve are serving in key advisory capacities to the state and nation. 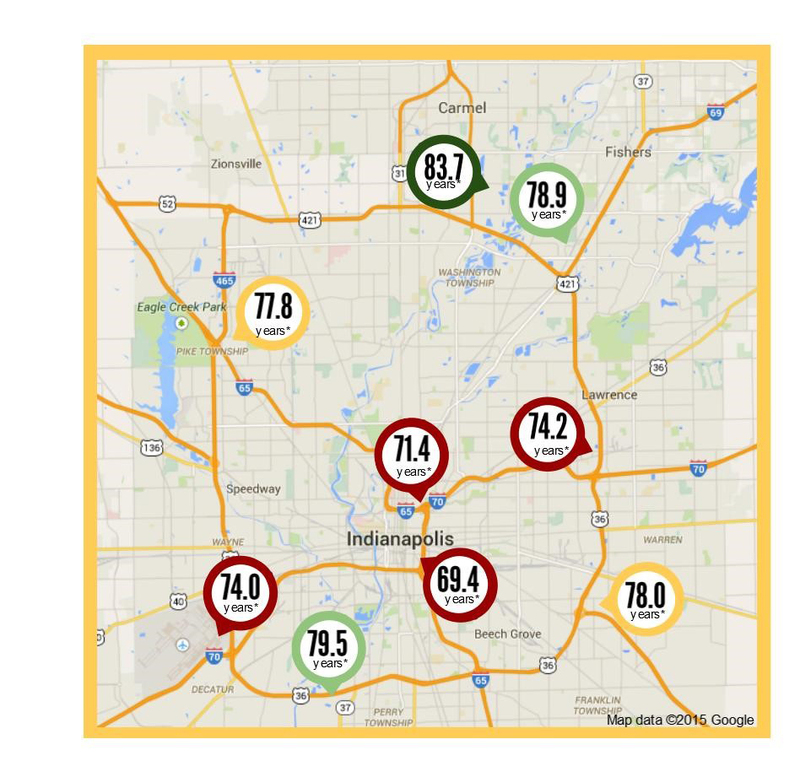 The stark differences in life chances of people living in the 104 zip codes of the Indy Metro area were brought to light by an analysis conducted by Fairbanks School of Public Health faculty. The report, Worlds Apart: Gaps in Life Expectancy in the Indianapolis Metro Area (July 2015), was presented at a community forum at radio station WFYI and has since served as a catalyst for ongoing discussion and collective action on the underlying causes of these disparities. This analysis was funded by The Polis Center. Students and faculty conducted a Health Impact Assessment in the Northeast Indianapolis Avondale Meadows Neighborhood (a food desert). The data were used to obtain a Tax Increment Financing District designation from the Indianapolis City Council and to successfully recruit a grocery store into the neighborhood that opened in the spring of 2017. We also worked with Health by Design and Indy Connect on legislation to support transit expansion in Marion County. The legislation was passed in November 2016 and the Indianapolis City Council is working on implementing the expanded transit plans. We completed an HIA with the Northwest Neighborhood to design a Quality of Life Plan for the neighborhood. From the community surveys nine action areas were identified. We have continued to work with the housing and food access committees. An HIA was also part of an EPA grant the city of Indianapolis received to evaluate the Northwest Area for brownfield redevelopment. The recommendations were used and now the City has a request for redevelopment proposal out for bids. IU FSPH is the home of the Chronicles of Health Impact Assessment, the first journal focused on HIAs. The journal is a partnership with the Society of Practitioners of Health Impact Assessment (SOPHIA). Through partnership with Healthy IU, Fairbanks School of Public Health faculty and students have had the unique opportunity to contribute to the improvement of health and availability of healthy choices in our own workplace. This team designed, conducted, and analyzed two rounds of a survey in which all of the roughly 17,000 full-time employees of Indiana University, across eight locations in the state, were invited to participate. Survey results have informed and guided the Healthy IU program’s five-year action plan and continue to gauge progress toward a healthier IU. For example, our 2013 survey revealed that 70% of IU employees say that stress is affecting their health. In turn, Healthy IU has responded by expanding stress reduction programs like Mindfulness-Based Stress Management and establishing a university-wide committee to target stress.